Dark orange with a pale rim. Burnt sugar, orange and a little fynbos on the nose. Terrifically rich and concentrated on the palate yet simultaneously fresh, the wine showing lovely acid integration, the result being that it moves really well in the mouth. The finish, meanwhile, is long and dry. Smashing stuff. 60% Cabernet Sauvignon, 30% Merlot and 10% Cabernet Franc. A somewhat controversial wine as some in attendance found it too lean and attenuated but I thought it was supremely elegant. An attractive floral note before red and black berries, cigar box and a hint of undergrowth. Lovely fruit purity, fresh acidity and fine tannins. Great balance and very little decay in evidence. Amber in colour. An enticing nose – a floral top note before lime, apple, mint humbug, spice and the merest hint of petrol. Lean with racy acidity and a pithy finish. Quite thrilling to drink and you don’t say that about SA Riesling often. On the whole, a most impressive line-up, serving to remind that is without doubt one of the country’s finest wine-growing properties. I had a 1998 KC Riesling in April and it was stupidly good. We really do drink our Rieslings too soon in SA. Way too soon. A thumbs up to KC who has, so far, had the foresight to not follow other Constantia producers in pulling out their Riesling. And those Sauvignon NLH’s have always been a bit underrated. 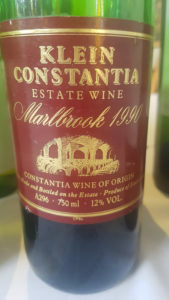 Where have all the pyrazines (remember, some people say that ALL pyrazines get more prominent with time in the bottle) in that ’90 Marlbrook gone, Christian? Come on, with 12% ABV, coming from a cool (in SA terms) site, it should be a green bomb, right? Hi Kwispedoor, The debate around pyrazine character on SA Cab and Bordeaux-style red blends is crucial and good on you for keeping it on the agenda. After yesterday’s tasting, it strikes me once again that we too often tend to see matters of wine appreciation in terms of binary opposites, so when it comes to pyrazine character wines are assessed as either “green” or “not green” whereas the right sort of “green” can actually be to a wine’s advantage. Interestingly enough, the least successful red yesterday was the Cab Sauv 2000, which also happened to have the highest alcohol at 14.2%. My insight here would be that “optimal ripeness” is not something which is exactly measurable but rather a matter of judgement on the part of viticulturist and winemaker. Is it possible to buy the 1998 NLH from KC still? Or anyone else, for that matter? Christian, do you think the 1998 NLH was from an especially good vintage, or are most vintages of it likely to be about as good after 19 years? Hi Joe, Tough question. On the one hand, I think SA late harvest/botrytised wines tend to age more rapidly than Sauternes or TBA especially in terns of colour but as we know, KC does do these wines extremely well – what was striking about the 1998 was the lack of acid “burn” that SA sometimes show.